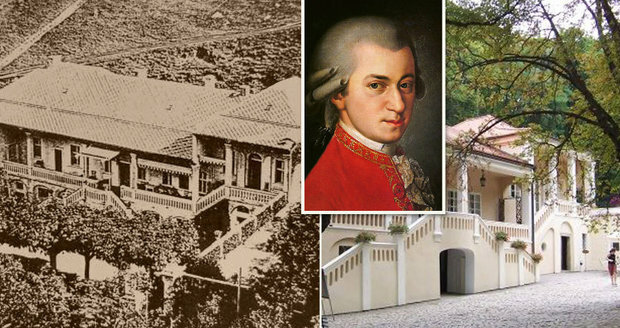 On January 28th, the day after Mozart's 263rd birthday, the Maestro received one of the best gifts the 21st Century could offer him: the preservation of his beloved friends' villa where he was a house guest in 1787 and 1791. Read more about this history. Bertramka, whose decline has been exacerbated by neglect over the past few years, was declared a National Cultural Landmark by the Minster of Culture, Antonín Staněk. This new designation means that the property will now have state protection and funding for rehabilitation and maintenance. I'd like to thank my colleague David Bahlman, an Architectural Historian and Preservationist, for his work in this matter and for keeping me informed through his contacts in Prague. I thought this would never happen, so I'm feeling both excitement and disbelief. If you've been following my coverage of this story, you'll know that I've long championed the effort with Friends of Bertramka and other allies. It was last February when I penned an article about what seemed like a hopeless situation. Read my article: "Praguers No Longer Understand Mozart, Metro States as Bertramka Declines." Now, one year later, after mounting public pressure, there is action. We raised our voices as a global community alongside the concerned citizens of Prague and succeeded. Bertramka has been saved from an uncertain future, a future that could have ended in collapse or demolition. Victory is ours! 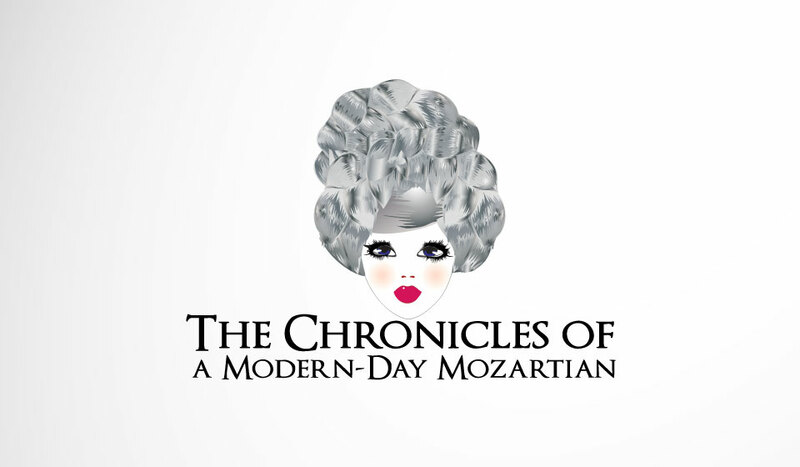 The Modern-Day Mozartian store is now open on CafePress! Stickers, buttons, magnets, postcards and luggage tags featuring my logo are readily available to ship worldwide. Why merch? It makes a powerful statement and reaches audiences through human interaction rather than through a screen. It's more meaningful and effective. I think most people would be more intrigued by seeing a bewigged character they encountered at the airport or in traffic than while skimming and scanning content on a device. Whether you have a sticker on your notebook, a button on your backpack, a magnet on your refrigerator or car, you're using a luggage tag on a trip or you're sending a postcard to a fellow Mozartian, signature merch serves an ambassadorial role. It's your stamp of approval, your endorsement, and it'll help bring new audiences to Mozart and my platform while giving you (the WolfGANG!) a fun way to support my work. CafePress was on my mind when I created the logo in 2016, but so many other projects and initiatives intervened that it simply didn't happen...until now! I've never had a paywall or asked readers to pay subscription fees, so in addition to audience development, opening a store also creates a potential revenue stream for me, something I can never have enough of as an independent professional! I've always believed that taking a social approach to preservation is key because audiences benefit exponentially through shared experiences. 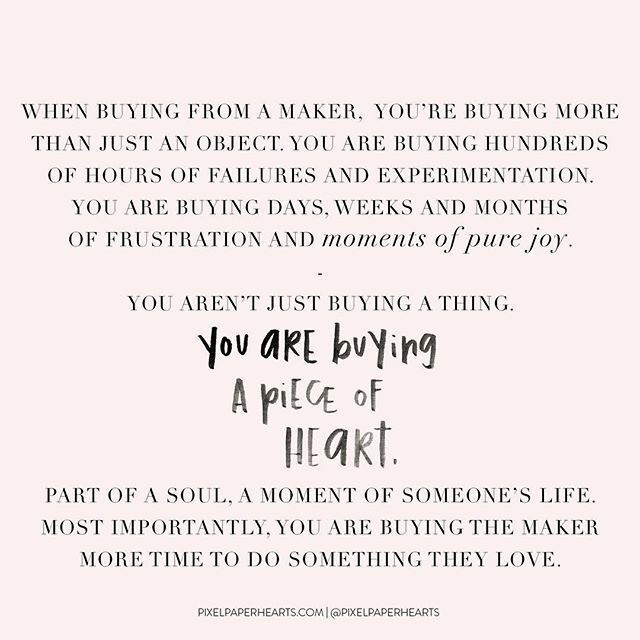 It's why I've created events and contests on Facebook as well as two fan collection exhibits at the Mozarthaus in Vienna. Promoting the public recognition of Mozart's audiences with an identity (logo) through which we can connect is also a part of the journey. And what's in a logo? Well, everything in terms of message and as little as possible in terms of design. When someone sees the Mozartian, I want them to know that she represents not only my work (I'm simply a catalyst or representative), but the efforts of the Mozartian collective. As musicians, audience members, consumers, patrons and volunteers, we all play a vital role in sustaining Mozart's music and heritage. We're storytellers who deliver contemporary context, socio-cultural perspective and human interest. We're agents of the living and ever-evolving music history of which we are a part. Our voice is one of great power and beauty, reflecting the joy and humanity of Mozart's music and the universal messages of love, unity and enlightenment conveyed within its measures. 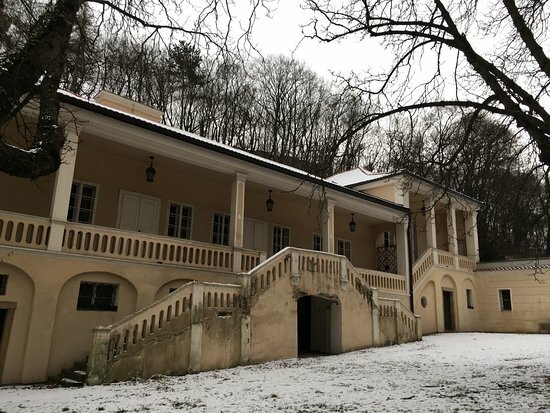 When I penned the article The Plight of Mozart's Eden: Saving the Villa Bertramka, it was a promising time for the landmark's restoration. Our organization, the Friends of Bertramka, an international alliance of Mozart fans, scholars, musicians and others who cared deeply about the stewardship of Bertramka, had a good working relationship with the owners, the Czech Mozart Society. The future looked bright and full of possibility. There's a reason why I haven't shared any recent updates about our initiative. Over the past few years, there was a steady decline in our relationship with the Czech Mozart Society and news from Prague became scarce. It saddens me to report that the Friends of Bertramka organization is now inactive due to a lack of partnership from the Czech Mozart Society. Their leadership have closed its doors to collaboration, so our activities towards fundraising and advocacy have ceased entirely. While the Czech Mozart Society continues to turn away helping hands, Bertramka has fallen deeper into ruin. They lack the funds to properly maintain the structure and have said so themselves. Since I've become aware of some developments in Bertramka's unfolding story from colleagues as well as my own independent research, I felt it was time to publish an update. As one of the only advocates keeping the general public informed about the afflicted cultural icon, it's a personal and professional obligation. Since I'm not fluent in the Czech language, it took me longer to locate some of this information. 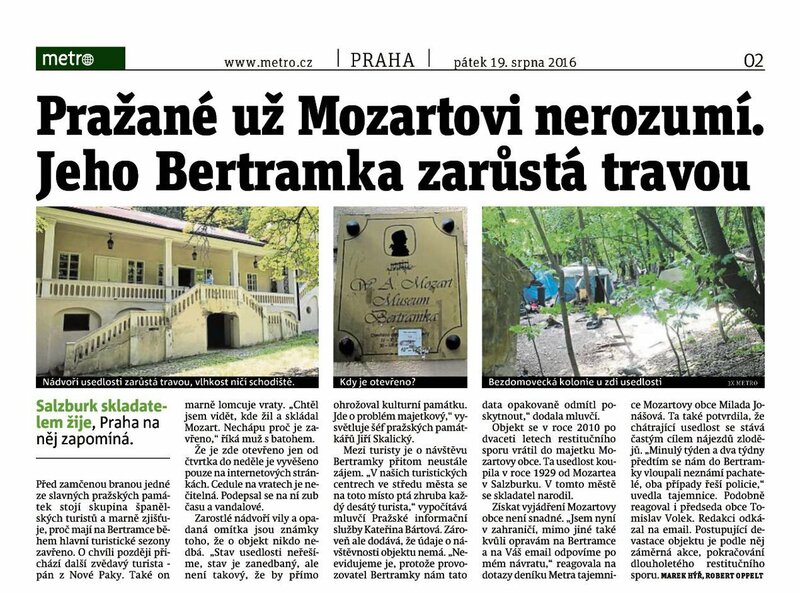 Of my 2016 and 2017 findings, the most alarming was a headline in Prague's Metro: "Praguers No Longer Understand Mozart, His Bertramka Grows with Grass" (August 19, 2016). As painful as it is to read, I'm thankful that the Metro decided to unabashedly report about the overgrown and much neglected state of the property. 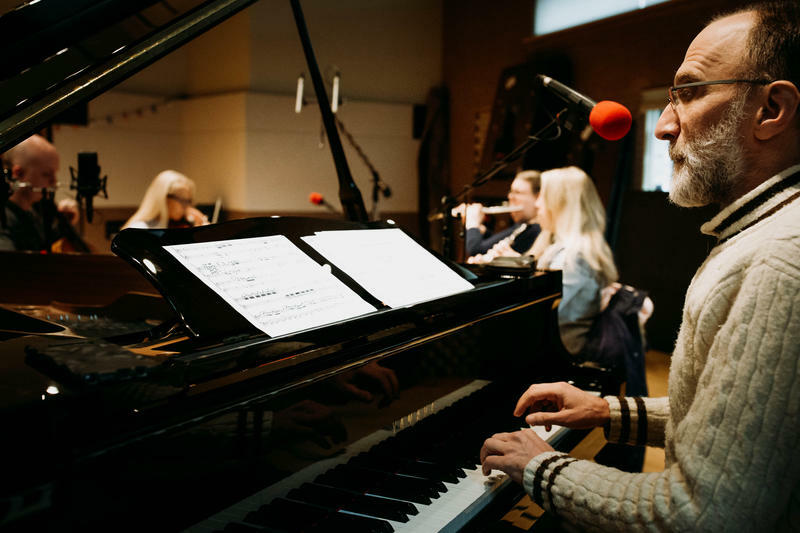 "Praguers No Longer Understand Mozart" makes reference to a comment the composer supposedly made in response to Prague's unprecedented and unwavering appreciation for his work: "Meine Prager verstehen mich" ("My Praguers understand me"). Case in point. "The shaded courtyard of the villa and the fallen plaster are signs of the fact that no one cares about the building." Few eyes outside of Prague have seen the Metro's article, and it makes me wonder what would happen if it were more broadly circulated. I hope that my mention of it here will raise greater awareness and encourage the Metro to follow the story for both local and international audiences. I've received inquiries from a few concerned individuals who have offered up their expertise and contacts for the cause including David Bahlman, an Architectural Historian and Preservationist. David was President of the Mozart Society of Philadelphia for over ten years and during that time worked in New York as Associate Director of Public Relations for the New York Philharmonic. David befriended H.C. Robbins Landon, who encouraged his love for Mozart, and himself became a patron of the Mozart Society of Philadelphia. 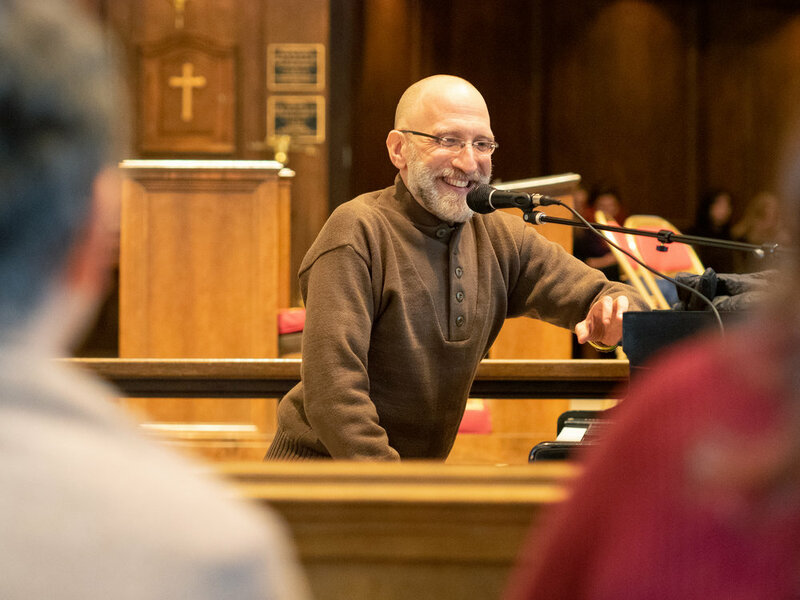 David is well connected in the world of opera and classical music, and would like nothing more than to use these connections and their resources to help save the ailing landmark. The following photo was taken by a tourist and posted on TripAdvisor in January 2017. When David visited Bertramka in 2015, he found its condition so shocking compared to his visit in the 1990s that he began searching for a way to take action. That's when he found me. He wrote: "Having discovered your website and enthusiastic involvement with Bertramka, I wanted to reach out to you as well in an effort to build the strongest coalition of advocates possible to find ways to break the stalemate in Prague. The building is not going to survive if restoration work doesn't start soon." David has made an effort to enlist Czech officials in the U.S., reaching out to the Counsel General in New York, the Czech Cultural Center in New York and the Embassy of the Czech Republic in Washington, D.C. His correspondence hasn't elicited any action from their offices, but they've acknowledged the negligence of Bertramka, disappointed tourists and a collective sadness among colleagues for its current condition. Some hopeful news arrived when David informed me that Dr. Katerina Samojska of the National Monument Institute had taught conservation techniques at Bertramka in May and June 2017. I was cautiously optimistic. Was this the beginning of a long-awaited restoration? Upon further investigation, it was evident that the workshop was a singular event that focused primarily on repairing plaster on the staircase. On June 8, 2017, the Metro published an article stating that "The main objective of the course is not to restore the object, but to train conservation specialists." On August 17, 2017, the NPU published an article with photos and video coverage of the restoration. On Bertramka's website, there are photos, articles and a video documenting these activities as well as some maintenance of the garden. As David concluded: "Major projects involving the stabilization of the structure weren't accomplished, so this minor work isn't adequate enough to protect the villa from further deterioration." Although the designation of "Mozartstadt" (Mozart City) is typically reserved for other cities like Augsburg, Salzburg and Vienna, I always use it when referencing Prague. It's one of the most important cities in his biography. But without any restoration activity moving forward, the amount of negative reviews from visitors accumulating online (TripAdvisor, etc) and more press coverage about Bertramka's predicament, I'm deeply concerned about its reputation as a guardian of this heritage. Any decrease in tourism or international partnership will inevitably impact any future attempts for Bertramka to rebuild and sustain itself as a reputable heritage site and museum. It goes without saying that this is one of the saddest articles I've ever had to write, but as my twin sister Sheryl always reminds me, preservation is not for the faint of heart. We lose our heritage (people, places, things) everyday due to neglect, greed and death. While it's impossible to prevent the loss of human life, our living heritage endures because we have the ability to document and communicate it to new generations. We can prevent most loss when it comes to our buildings and artifacts. Bertramka is in a state of decline and the damage will become irreversible if too much time passes with inaction. There's absolutely no reason why it should become a casualty. I'm disappointed in the lack of interest shown by institutions, organizations, musicians and singers. Many famous artists perform in Prague, yet remain silent on the issue of Bertramka. I'm confident that it would take one star in the world of opera or classical music to advocate for a resolution and funds would be raised for its restoration. At the dawn of a new year, Bertramka's fate remains uncertain. Will the winter be harsh on the already fragile structure or will it be mild and forgiving? And once Bertramka endures its literal and figurative winter, what promise awaits for it in springtime? Will Prague make good on its historic relationship with Mozart and act in time for the beloved villa to be saved?